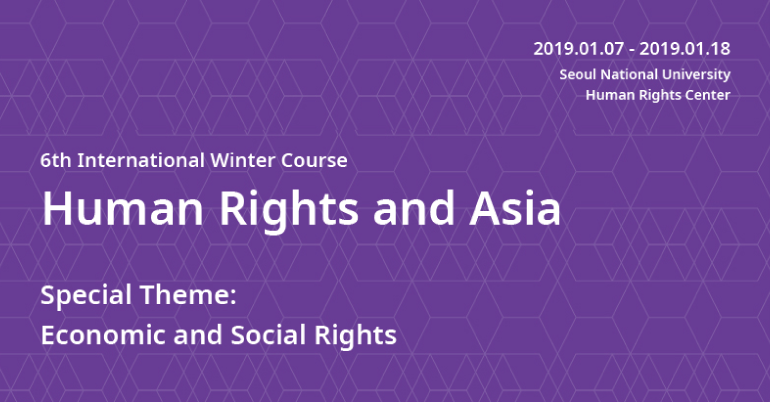 The International Winter Course ‘Human Rights and Asia’ intends to allow participants to think about the universality of human rights in particular contexts of Asia and to gain a deepened understanding of human rights issues in this region. This two-week intensive course was launched in 2014 and is now awaiting participants for its sixth year. A special lecture on the ‘Universal Declaration of Human Rights and Asia’ will mark the 70th anniversary of the UDHR. A cross-cutting theme of this upcoming course is economic and social rights. Participants will examine economic and social rights in relation to gender, refugees, and in the context of corporate responsibility. Participants will also discuss the theory and practice of social and economic rights in the context of Asia. Participants will be involved in a multidimensional learning that includes not only lectures, but also presentations, discussions, and visiting the field of human rights advocacy in Korea. Our course ultimately aims at fostering an inter-disciplinary study and multidimensional advocacy activities on human rights in Asia. All selected participants will be provided for the following. *They DO NOT provide stipend, breakfast, dinner during the weekdays and meals during the weekend. This course is designed for postgraduate students, junior researchers, activists, lawyers and national and international civil servants from all countries around the world who demonstrate a high level of interest in human rights and Asia, and this year’s special theme, economic and social rights. The entire course is taught in English. Fluency in oral and written English is therefore required. The number of participants is limited to 20 and participants will be selected in a way to ensure the diversity within participants in terms of professional and academic background, region and field of interests. The selected participants will be expected to attend all the sessions throughout the course and actively contribute to discussions. * Please be sure to use the form below. We do not accept the other forms. – The name of the letter of recommendation file and the subject line of the e-mail should be [Family Name & Given Name of the Applicant – Recommendation 2019]. Please make sure the recommendation letter also meets the deadline below. – Applicants must fill out the name of their referee in their application form.